Smoothie bowl, meets oatmeal bowl. 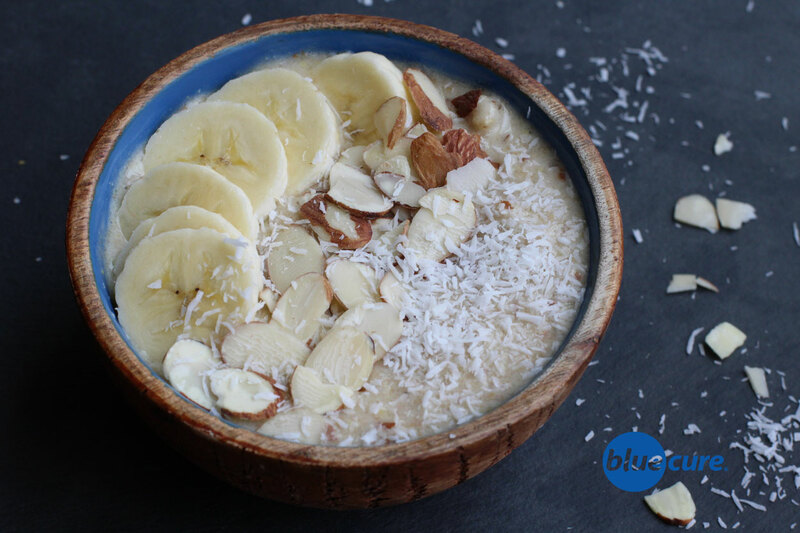 As the heat of summer approaches, cool down your oatmeal bowl with a banana-almond smoothie. If you like creamy, sweet oatmeal that tastes like dessert, then this one is for you! Mix and match the smoothie recipe by tossing in other fruit, such as berries or mangos to give a spin on the recipe below. Top it with coconut and sliced almonds, as suggested—-or maybe even try stirring in some chia seeds for a different texture. Add in some cinnamon and vanilla, if desired— the options are endless! Bring ⅔ cup water to a boil. Reduce heat and then add the oats. Allow the oats to cook. Then allow to cool. In a blender, combine the banana, 2 tablespoons almonds, ¼ cup water, 1 tablespoon flaxseed. Blend until smooth. Pour the oats into a bowl and top with the frozen banana smoothie. Top with the remaining almonds and coconut flakes. Enjoy!